to create a lasting record of their work. The information the children gathered came not just from books but from people, places and objects. They listened to and questioned experts, local people and relatives; they handled cogs and levers; they reported what they had seen. 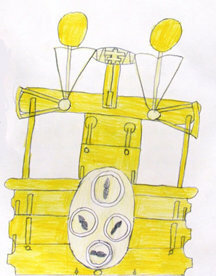 a digital and print archive of the children’s work and the new display in the church. In all this the children were guided by Frances Kelly, an experienced Arts Worker from Hull who worked with class teachers Anna Crosby and Jane Portess. The Project was managed by Trevor Millum, Chair of the Better Barrow Community Project and supported by a grant from the Heritage Lottery Fund.